EasyRecovery™ software products offer home users or businesses complete solutions for their data recovery, file repair and disk diagnostic needs. Depending on your data loss situation software is recommended only when your hardware or computer system is functioning properly. The program allows you easily recover data on your hard disk as in the simplest cases, for example, after removing them from the basket and lost because of incorrect formatting a disk or a virus attack. In the event of data loss – the inability to boot the system, the program allows you to create a floppy disk, booting from that, you can restore the data, moving them to another disk. The program also allows you to find the disk for files of more than 225 different types. Recovers files from a FAT partition, and NTFS, hard drives IDE / ATA / EIDE, SCSI, floppy disks, Zip disks, and Jaz. EasyRecovery package is able to restore Zip archives and documents created in Microsoft Outlook, Access, Excel, PowerPoint and Word. Built-in utility for diagnosing hard drive Ontrack Data Advisor provides users a powerful tool for rapid assessment of local drives. A must-have solution for all businesses to recover data from file systems supported by Windows and Mac operating systems. Do-it-yourself data recovery now equipped with data erase and data protection features. 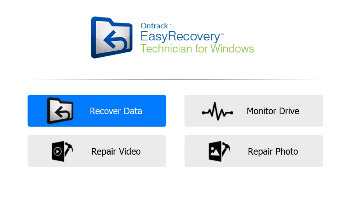 Ontrack EasyRecovery Professional provides you with an enhanced set of recovery tools, including: mail recovery, hex viewer, S.M.A.R.T., bad block/block usage diagnostics, imaging tools, copy disk and refresh disk. Use to perform unlimited recoveries from local storage and external media with an easy-to-use, intuitive data wizard. The most advanced edition of Ontrack EasyRecovery with network recovery support for companies that need to protect multiple workstations. Now equipped with data erase and data protection features. The Technician Edition provides user with VMware support for recovery and permanent deletions of data. This software is also equipped with hardware and software RAID recovery support and an enhanced set of recovery tools. The latter are: mail recovery, hex viewer, S.M.A.R.T., bad block/block usage diagnostics, imaging tools, copy disk and refresh disk. Recover lost or missing data from hard drives with RAID 0, 5 or 6 with Ontrack EasyRecovery Technician. Not only does this tool include all of the features of the Home and Professional versions, but it also has been designed to simplify the data recovery process for technicians.